Fraud has been an ongoing problem for Communication Service Providers (CSPs) and their customers for decades, with a ever evolving cat and mouse game being played out between CSPs and fraudsters. This issue rings closer to my heart as I was recently a victim of the “One Ring” scam. Upon doing some research, I discovered that I was far from the only one. Unfortunately telecom fraud claims billions of innocent victims across the globe. The cost of fraud to CSPs in 2017 was nearly $30 Billion. What is even more concerning however is that with 5G; the magnitude of the fraud problem will rise hundredfold. The surge in the amount of connected devices and sensors will lead to an exponential rise not just in the volume and velocity of data streaming in, but also significantly increase the level of complexity associated with processing the data to identify and prevent scams. Traditional fraud prevention techniques implemented by CSPs will just not be viable anymore. Fraudsters hack into the CSPs network and make expensive calls to international phone numbers resulting in high bills for subscribers. Once the calls are made and billed, either the subscriber or the CSP have to bear the costs. Hackers utilize illegal routes to deliver international text messages at lower costs, depriving CSPs of the revenue derived from routing messages from legitimate international routes. Hackers also send out scam texts to trick subscribers into making calls to expensive international phone numbers (similar to making a call to a 900 number). Hackers also transmit spyware, bots, adware, and viruses via text messages that can take control of the subscribers device to make unauthorized calls and texts or steal personal information. IPX is used by CSPs to exchange IP based traffic between subscribers of different cellular and fixed operators along with other ISPs via an IP based network-to-network interface. Fraudsters often exploit the vulnerabilities between the network interface to hack into a subscriber’s device and rack up large bills. Gartner is predicting over 20 Billion connected things by 2020. What gets overseen in the IoT hype, is the sheer amount of “connected things” that will be left unsecured. The massive scale of IoT and the access to valuable data offers up a very compelling opportunity for fraudsters. IoT devices have already been used to make fraudulent purchases, and even to launch DDoS attacks. eSIMs are embedded SIM cards that replace physical SIM cards that were used in cellular phones. eSIMs allow for easy provisioning and connectivity, and eliminate the need for having physical SIMs. However, along with the benefits of eSIMs, they also offer a new path for hackers to infiltrate subscribers electronically and to steal and misuse subscriber data. It is important to note that when it comes to fraud, in-event detection and prevention is far more desirable than post-event reconciliation. Once the fraud occurs charges are levied either on the CSP or the subscriber and revenue is lost. At 5G scale and speed however, in-event fraud detection and prevention is easier said than done. So how can CSPs effectively manage the sheer volume, velocity, variety and complexity of fraud threats in the 5G era? Fraudsters try to veil attacks with complexity. Traditional fraud analysis involved analyzing CDR records, CDRs however lack crucial information and are generated after the call is complete (when it is too late to stop fraud). Signalling System No. 7 (SS7) however contains additional information that may be crucial to fraud prevention such as: subscriber location, inter switch call attempts, request for subscriber information, and more. External radio probes or automated subscribers can also be used in conjunction with SS7 to detect fraud. In addition to monitoring and identifying fraud correctly (without blocking legitimate subscriber activity) it is crucial to block the fraudulent calls / texts, etc before they are placed. The database needs to be intelligent and agile enough to detect changing fraud threats and counter threats. To block fraudulent transactions and users, the underlying database needs to analyze thousands of attributes such as subscriber behavior, geolocation, device information, transaction type, etc in real-time. Using built-in machine learning algorithms these attributes are compared to correct behavior and statistical anomalies are identified and blocked in real-time / in-event, prior to the transaction occurring. 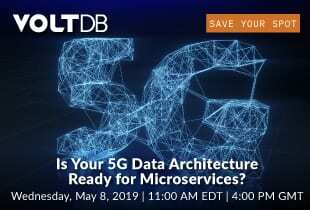 5G is expected to deliver microservices such as IoT at massive scale. The database engine must be able ingest data from multiple channels and automatically apply thousands of rules with built-in machine learning in milliseconds to prevent fraud, while processing millions of operations/second. Now that you’re thinking in terms of what the future may have to bring, is your technology up to snuff? VoltDB is the only operational database that combines all of the above critical elements required for online fraud detection; learn more or download our free trial.